Comfy was my very first thought when I woke up for work this morning. Well, so was.. "I don't want to wear any pants today", but tbh that's just a daily struggle for me. As much as I love the look of crop tops and skinny jeans, sometimes you just want to feel like you're wearing nothing! Nahm'sayin? The very last thing I want to do in the morning is to take an extra 10 minutes to squeeze my legs into some skinny jeans. So this morning, I opted for a very loose grey tee from Brandy Melville, aka the softest shirt in the world. I really have no idea what material Brandy uses for their clothes, but it seriously feels heavenly on your skin. This tee is pretty big so to give it a little bit more shape, I loosely knotted it on the side. 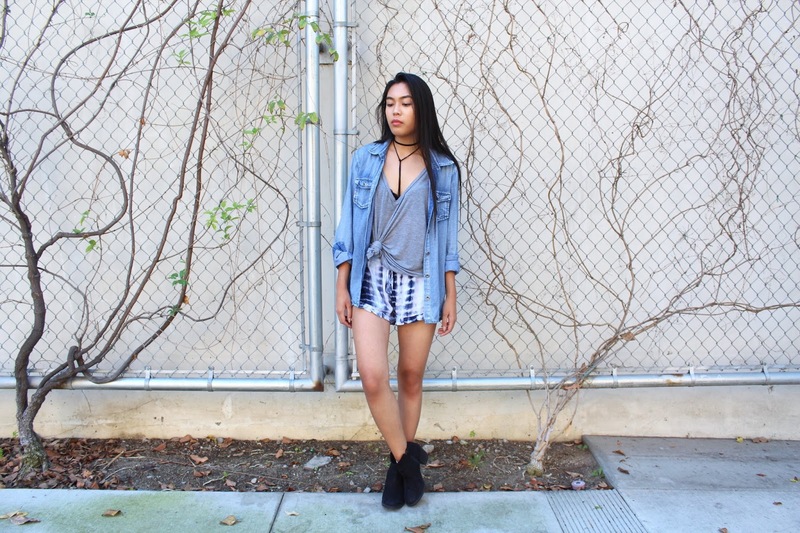 To tie in the comfy vibe, I wore one of my favorite tie-dye shorts. And yes, I'm completely aware that it looks like I decided to just wear my pajamas outdoors but I honestly have no issue with that whatsoever. I also decided to throw on this denim button-up to give this outfit a little bit more texture and to make it not look like I just rolled out of bed. For accessories, I have this choker "necklace" which is actually just some leftover suede string that I found in my crafts box! I was inspired by Vanessa Hudgens (aka my spirit animal/girl crush), who was wearing a similar necklace and I figured I could just DIY it myself. I know some companies are starting to sell these types of necklaces at high prices, so save yourself some money girl and head over to a crafts store! You can customize it however your heart desires by just wrapping it around your neck differently. Simple as that! 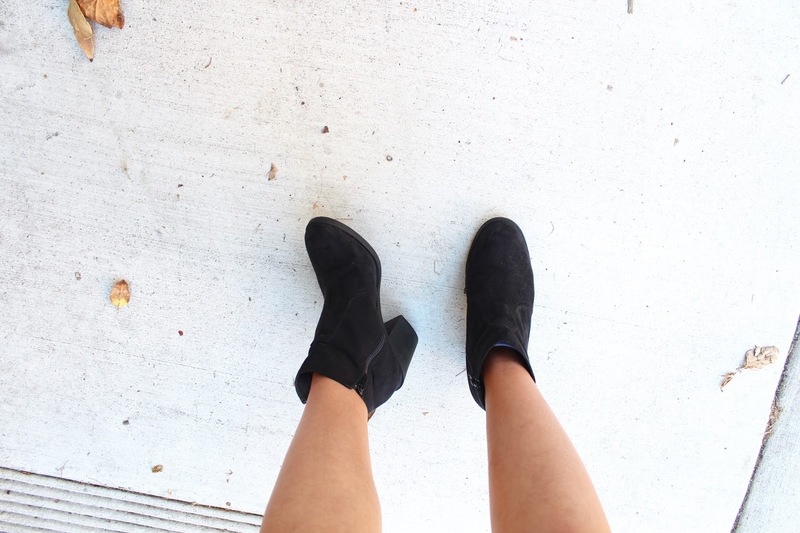 And finally, to dress up this entire look, I wore some classic black booties. A perfect way to make a comfy outfit a little bit more dolled up! OMG loveee your necklacee! I so want to get one like that.